MATT Wallace called Bryson DeChambeau a “worthy champion” after he won the Omega Dubai Desert Classic by seven shots – but vowed to try to catch him the next time they do battle. Wallace, who hails from Moor Park Golf Club, in Hertfordshire, finished alone in second after mixing six birdies with two bogeys in his final-round 68 but never came close to applying real pressure on the American. And the Englishman – who won three times in a year 2018 – is keen to make amends when he next goes head-to-head with the hottest player on the US PGA Tour right now after his fifth win in less than a year, including his first overseas this weekend. “I wanted to give it a go,” said Wallace. “I really wanted to put some pressure on Bryson. “He was obviously scoring well. Credit to him, he’s played great from what I hear and he’s a worthy champion this week. “It’s great to have him here. But I’ll try and get him next time. “The round was really good in parts, really shabby in parts. Not good enough to put any pressure on, but just about good enough to get second. “I’ve got to take the positives from that early on in the season to get the juices flowing like that. And to play with Ernie (Els). “I mean, I didn’t see myself having 165 yards in for my third on the last to try and get it done, but yeah, I’ll learn from that. “I’ll put better swings on it next time. Overall, I’m happy. I actually drove it amazingly apart from that last tee shot, really. 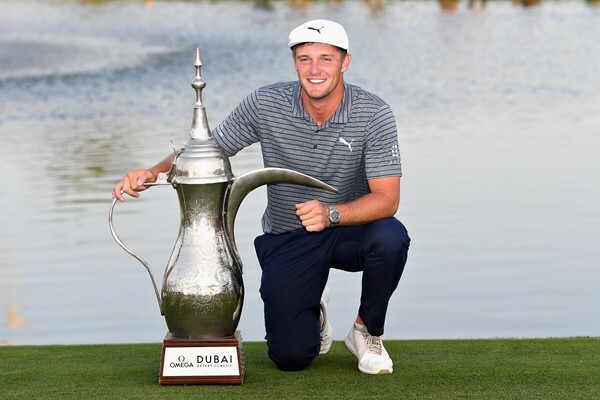 DeChambeau’s maiden European Tour title came courtesy of closing 64 to win the 30th anniversary edition of the Omega Dubai Desert Classic. The World No. 5 had set himself the target of securing his first professional overseas win at Emirates Golf Club ahead of the event. And the duly delivered, carding an eagle, seven birdies and a single bogey on the fourth day to finish the week on 24-under par and set a new tournament record. Last year’s champion Li Haotong, who played alongside DeChambeau in the final round, had held the previous record after producing a winning score of 23-under 12 months ago. But the Chinese star was caught up in controversy in the first ruling of the new season based on the R&A’s rule changes, which came into effect at the start of January. Li’s caddy briefly stood on the line of his player’s putt as he took his stance, but the quick player released the trigger before he had moved out of the way as stipulated in the rule change. And the European Tour’s referees were left with no choice but to impose a two-shot penalty, dropping the defending champion down to a share of 12th place, having stood tied for third before he left the 18th green. Englishmen Paul Waring and Ian Poulter, and Spaniards Sergio Garcia and Alvaro Quiros ended up sharing the third place prize money on 16-under. DeChambeau, who made his Ryder Cup debut for the United States in Paris – where Europe inflicted a record defeat on the Americans – came into the final round with a one-shot advantage over nearest challenger Li. Another birdie from close range followed at the long third but despite creating more chances on the front nine, he had to settle for six more pars to reach the turn in 32. The 25-year-old extended his lead further as he began the more scorable back nine, holing his 10-foot eagle putt at the long 10th before picking up a birdie at the 11th to move to 22-under and open up a six-shot lead. He dropped his only shot of the day at the 12th but bounced back with a birdie from eight feet at the long 13th. DeChambeau then holed a six-foot birdie putt at the 14th and after coming agonisingly close to picking up further shots at the 15th and 16th, he rolled in from six-feet at the penultimate hole for his seventh birdie of the day. DeChambeau, who parred the last, was delighted with his final-round performance. He said: “I was happy with my game. I executed a lot of great shots. “It was obviously a lot of fun to be able to finally hoist an international trophy, I’m so happy about that. “I was trying to shoot 25-under and missed it by one, but I’m happy with the results for sure.